Home » Android , Infinix , Mobile , Reviews » JIM's Big Thing is INFINIX HOT NOTE X551 - See Specs and Price! 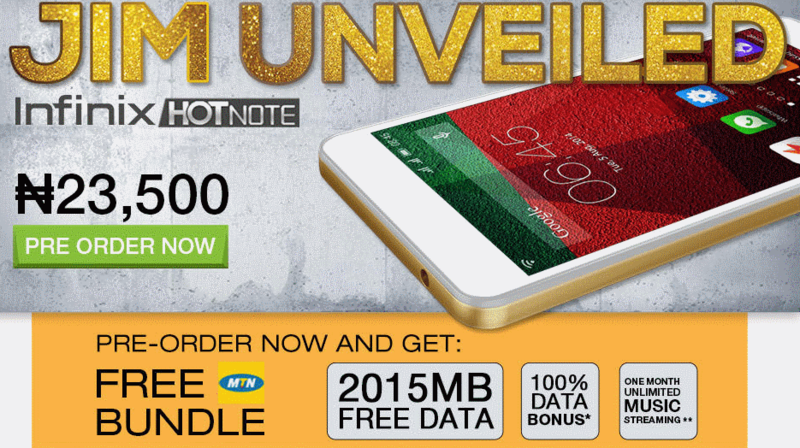 JIM's Big Thing is INFINIX HOT NOTE X551 - See Specs and Price! What still shocks me about JIMs BIG THING is the 20 minutes charge time for use upto 7 hours, Unbelievably True! When JIM's Big Thing hit the internet, it kept many of us guessing, "What device could be Behind such a Title? ", JIM has been Unveiled, so we are happy to announce to us that JIM's Big Thing is The New INFINIX HOT NOTE X551. The anticipated New Product from Infinix Mobile has been launched and set to be released into the market by Jumia. It means JUMIA, INFINIX MOBILE & MTN. These were the Great Companies that had joined hands and heads to Bring us this Smartphone. This smartphone is brand new, elegant smartphone, quite visible at hand with nice colours to suite your Style, whoever you are. You can PRE-ORDER HERE NOW! To Wrap it up, MTN gives you 2015MB Data For Free after you purchase.